G.I. Joe (or Action Force to British readers with long memories) is at its best when it forgets its toy store origins and focuses on delivering solid stories of warfare with a touch of the fantastic. 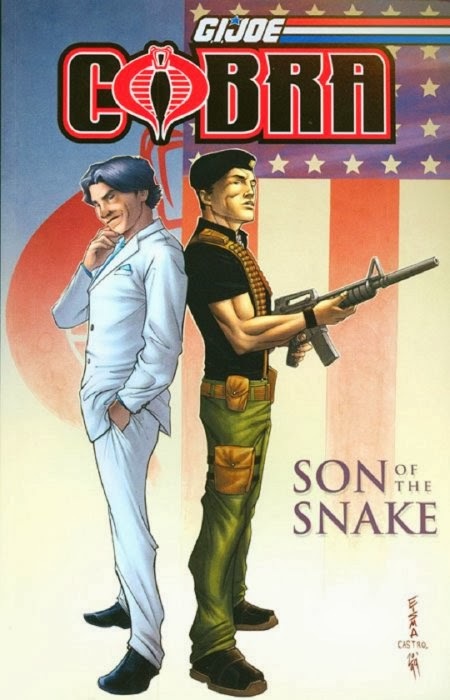 Cobra: Son of the Snake is a good example of what the franchise can be used for. A tale of double-dealing and espionage, it works on multiple levels – as a decent spy thriller, but also as a reasonable detective procedural with a nice sprinkling of action adventure. A catastrophe has severely reduced G.I. Joe's resources. This ups the game slightly; the heroes can no longer rely on ridiculous super-technology to track bad guys and shorten the chase, and now they have to use their heads a little bit instead of just beating the tar out of villains. The cast of characters has been selected fairly carefully. Some of these heroes will never get their own action figure, and that’s a good thing; it allows the tale to focus on believable characters in a larger-than-life world. The artwork is messy and gritty, but still manages to be very easy on the eye. The action scenes are strong, without resorting to cheap gimmicks, and violence is used sparingly and to good effect, with a hyper-violent scene early on serving as an anchor for later events. Fans of the more recent Bond movies, as well as those who dig shows such as NCIS might want to consider taking a look at G.I .Joe: Cobra – Son of the Snake. This particular serpent really has shed its skin and become something much more interesting than an extended toy advert. There’s enough here for fans of the franchise to enjoy but it’s also a good stepping-on point for new readers.